Our treasured family recipe! 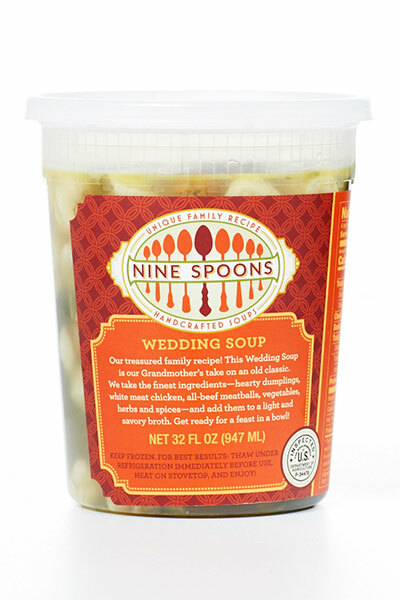 This Wedding Soup is our Grandmother’s take on an old classic. We take the finest ingredients – hearty dumplings, white meat chicken, handmade meatballs, vegetables, herbs and spices – and add them to a light and savory broth. Get ready for a feast in a bowl! 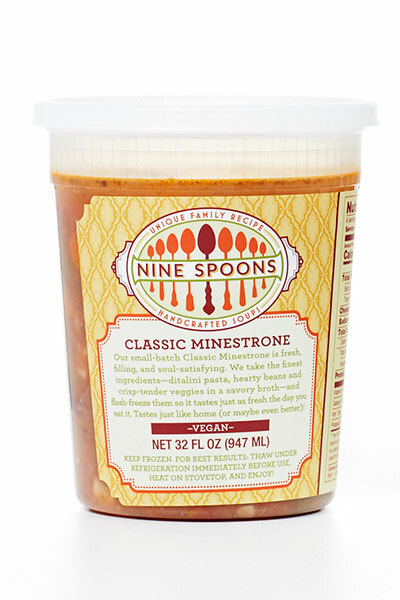 Our small-batch minestrone is fresh, filling, and soul-satisfying. 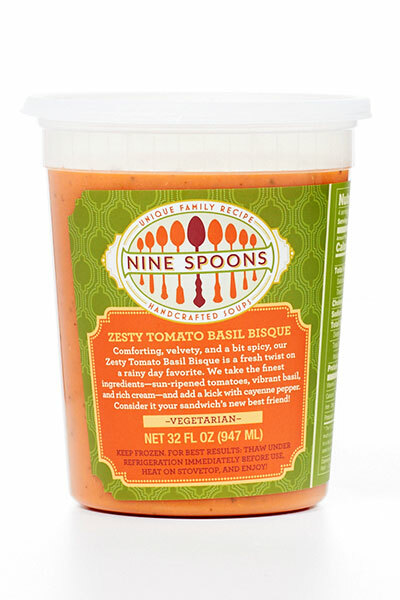 We take the finest ingredients – ditalini pasta, hearty beans and crisp-tender veggies in a savory broth – and flash-freeze them so it tastes just as fresh the day you eat it. Tastes just like home (or maybe even better)! 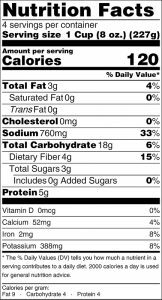 Water, Tomatoes (tomatoes, tomato juice, sea salt, citric acid, calcium chloride), Red Kidney Beans (water, kidney beans, sea salt), Celery, Cannelloni Beans (cannelloni beans, water, kombu seaweed), Onion, Green Beans, Pasta (semolina [wheat], durum flour, niacin, iron [ferrous sulfate], thiamine mononitrate, riboflavin, folic acid), Carrots, Vegetable Base (vegetables and concentrated vegetable juices [carrot, celery, onion, tomato, onion, dehydrated potato, dehydrated garlic] hydrolyzed soy protein, salt, yeast extract, sugar, maltodextrin, soybean oil, spice extractive), Olive Oil, Garlic, Basil, Kosher Salt, Sage, Italian Seasoning (marjoram, thyme, rosemary, savory, sage, oregano, and basil), Black Pepper. 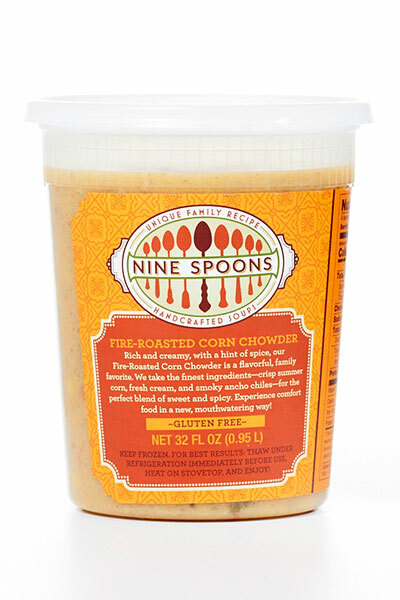 Rich and creamy, with a hint of spice, our Fire-Roasted Corn Chowder is a flavorful, family favorite. We take the finest ingredients – crisp summer corn, fresh cream and smoky ancho chiles – for the perfect blend of sweet and spicy. Experience comfort food in a new, mouthwatering way! 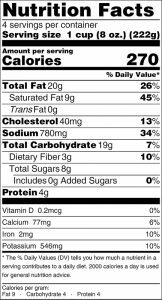 Milk, Potatoes, Fire Roasted Corn, Corn, Onions, Canola Oil, Carrots, Bell Peppers, Celery, Jalapeno Peppers, Kosher Salt, Garlic, Cilantro, Black Pepper, Ancho Pepper Powder.